1. Conductor : fine-stranded bare copper. 2. Core insulation : cold-resistant polyvinylchloride (PVC). 3. 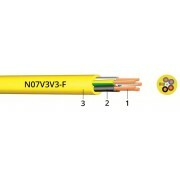 Outer sheath : polyvinylchloride (PVC), yellow. 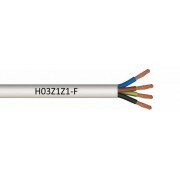 Conductor : flexible conductor bare or tinned copper, class 5. Insulation : thermoplastic mixture of TI6 quality. 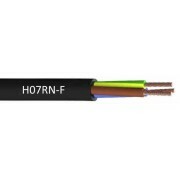 Outer sheath : thermoplastic sheath of TM7 quality. Conductor : flexible copper, class 5. Insulation : elastomeric mixture insulation of EI4 quality. Outer sheath : polichloroprene sheath, EM2. Conductor : flexible fine stranded bare copper, class 5. Insulation : rubber (EPR) E14. Sheating material : rubber (CR) EM5. Conductor construction : fine stranded, class 5. 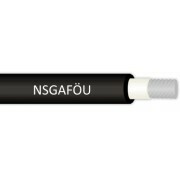 Sheating material : rubber (CR) 5GM5. 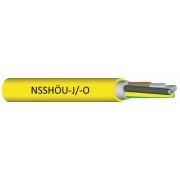 Protective conductor : NSSHÖU-J - Yes. NSSHÖU-O - No. 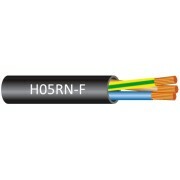 Insulation : rubber (EPR) 3GI3, halogen-free.